I'm pretty sure the story appeared in an anthology, and this was a one-off, but I can't say if it was the only story in this issue. I don't remember the plot, but it was set in a post-apocalyptic future or some similar type of wasteland. The main characters were a woman and a lizard (gecko-sized), and if there were any other characters, they were inconsequential. The lizard could talk, or at least had thoughts like a human. I think the lizard acted as a guardian for the woman, and one of the two, probably the lizard, had some kind of wish-granting or reality-altering powers, yet they remained in the wasteland, despite the story giving us visions of other possible, non-wasteland worlds. Either through dialog between the two, or an internal monologue by the lizard, there was plenty of musings about the circumstances leading to the creation of the wasteland, and/or the necessity to wield supreme power responsibly. While researching this on the internet, the story seems like it would have been at home in something like Witzend or Hot Stuf'. Having found scans of most issues of these series, I'm pretty sure, though, that it was not in either of those series. Neither I nor anyone I knew frequented comics specialty shops, so while this story almost certainly wasn't from Marvel or DC, it couldn't have been published so far underground that a pre-teen circa 1980 (plus or minus a couple years) in Chicago would have had a hard time obtaining it. Other series I've checked and dismissed: Alien Worlds, Alien Encounters, Love and Rockets, Star*Reach, Creepy, Eerie. The story is more sci-fi/fantasy than horror, but I checked the horror mags anyway. I believe I've looked at all of Marvel's and DC's sci-fi anthologies from the time, and didn't find it. Heavy Metal is a possibility, but I don't remember the art having a European flavor. I've checked some, but not all issues, from the time period and haven't found it yet. It's the story by Bruce Jones and Richard Corben "A Woman Scorned.". 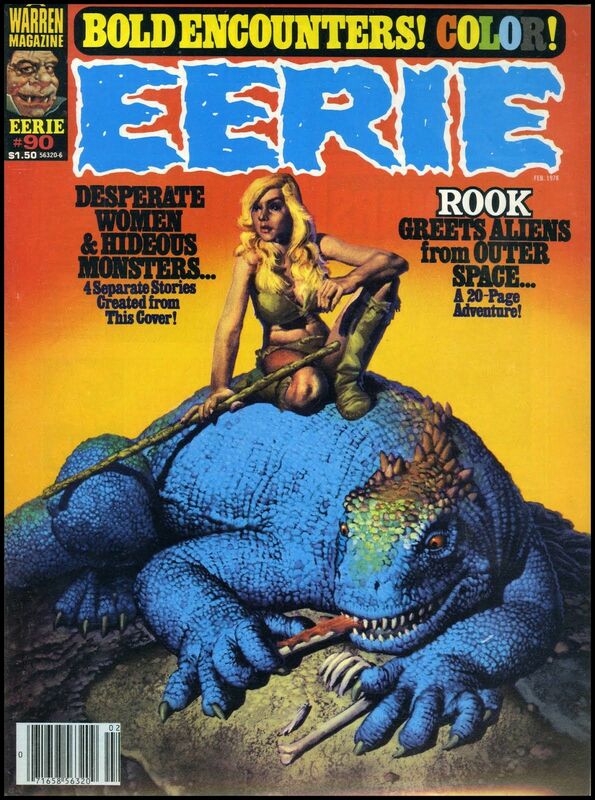 It was published in Eerie #90 (February 1978). In this story a "normal" girl but who has powers capable of altering reality gets her first love affliction. She surprises her boyfriend with another girl and in an outburst of rage calls him "rat, snake, stinking little lizard", or something similar, and wishes aloud that the world disappears. As a result of her anger, she and her reptilian boyfriend wake up in a devastated world with no more population than themselves. She suffers amnesia because of her previous wish, and the reptile-boyfriend tries to make her remember little by little her previous life. As she remembers, the world and the boyfriend return graduallly to normal. But it is an endless cycle. Every time the boyfriend manages to awaken the girl's memory to the point where she suffers her anger attack, it all starts all over again in the devastated world of the beginning. Are there more than three Superfun Adventures of Jax?